I just spent the last week on vacation in Northern California, visiting with my family and attending the wedding of the daughter of friends I have known for over 30 years. My entire nuclear family gathered over the weekend at my brother’s home and we shared some fantastic bottles of wine, great food and best of all some terrific stories. My brother’s children are 5 and 8 and delight in hearing anecdotal stories about their dad and their two aunts as young children. There are the classic stories that seem to come up on every family reunion but there were a few that I hadn’t heard in awhile and had even forgotten such as the time my sister caught her first fish at the age of 7. She was so scared that she dropped the pole in the (shallow) water while the fish flopped around on the line. While not particularly funny, the way my dad tells it, imitating the poor fish and recreating the look on my sister’s face, had the girls howling with glee. Naturally we didn’t seem to get this stuff on video but having these stories recreated time and again keep them in existence for each generation. 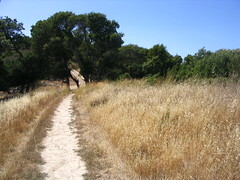 I managed to get in several hikes in the Marin foothills while I was there. Some were quite strenuous and after living in Houston for the past 15 years, I’m not really used to walking up and down hills. But I had the experience of a lot of sensory memories while I was on these hikes. I grew up in California and my husband and I lived in Northern California during the early years of our marriage. I always did a lot of hiking in these same areas so walking through them again didn’t so much bring up memories of specific things that happened but memories of smells and the way my body felt years ago walking through the same grassy paths, feeling the sun on my face as I followed dusty trails up and down these same hills. I was thinking about these sensory experiences since I seem to have them a lot whenever I go back to some place I spent a lot of time in at an earlier stage in my life. I know great writers are adept at describing the nuance of an experience such as that so that you can feel where the narrator is. But in my line of work, which is primarily video, there really is no way to share a sensory experience. I remember years ago reading about how computers some day would be able to mix and generate scents so that if you were reading about freshly mown hay, that smell would be able to be manufactured by your computer. Sounded very futuristic to me, this ‘smell-o-vision.” That has never materialized but it would sure be great to share some of those senses with you.